The gold dupe bug discovered in Patch 1.0.8 has been fixed, and Blizzard is dealing with those who exploited it. Earlier this month, Blizzard rolled out Patch 1.0.8 for Diablo III. The patch aimed to increase incentives for players playing the game co-operately in groups, but unfortunately introduced an exploit that reportedly allowed players to dupe trillions of gold. In a blue post on the Battle.net forums, Blizzard stated that the exploit has been fixed, all region's Auction Houses have been brought back online, and players who chose to use the exploit for personal gain are having their accounts banned and gold confiscated. As well as this, all proceeds from Real Money Auction House transactions conducted by the suspended or banned players, including all of their sale proceeds that were intercepted as well as Blizzard's transaction fee, will be donated to Children's Miracle Network Hospitals. Its a nice gesture from Blizzard, which could have easily pocketed all of the proceeds from these invalid transactions. If you bought items that were re-sold with duped gold, or simply had nothing to do with the exploit and are concerned about a possible roll-back, don't worry. "A rollback would mean bringing the servers down for a lengthy period and a loss of all progression since 1.0.8 was released," said Blizzard. "Many players made significant accomplishments in the game that required time and dedication, and we felt it was worth the work involved to try to preserve these efforts and go after the exploiters instead." "With this in mind, we elected not to roll back the servers in The Americas and are instead working to remove duplicated gold from the economy through targeted audits and account actions"
Of the small percentage of players that actually had the billions of gold required to perform the exploit, only 450 of them actively abused it. As for how it actually worked: "The bug was the result of a coding error that was exposed when we increased the gold stack size from 1 million to 10 million. 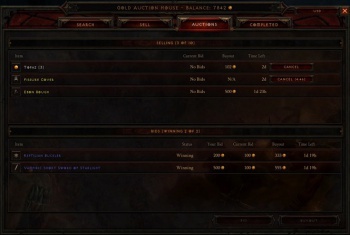 This resulted in an overflow on cancelled auctions that yielded a greater amount of gold in return." Blizzard took the Auction Houses offline to perform a full audit of all transactions that took place after the patch went live. It was able to isolate accounts that appeared to be exploiting the bug as well as collaborators that held gold or items for the exploiters. Once confirmed that an account was involved in the exploit, Blizzard either banned or rolled back the account depending on their activity. The bug itself was a pretty large oversight, but the fact that Blizzard are going to great lengths to correct it, instead of simply taking the easy way out and rolling back all servers, and donating the proceeds to charity, is an admirable move.